I have been doing a personality column for Natural Health, where each month I provide some insight into different personalities. Here is some insight into The People Pleaser. Does this sound like anyone you know? How Do I Deal with a People-Pleaser? People Pleasers will expect you to take the lead and make all the decisions in a relationship, whether at work, home, or in social situations. Over time this can drain your resources, turning your former willingness to play the leading role into a source of resentment. Trying to avoid them will be hurtful and could cause their already brittle sense of self to crumble. Like with most ingrained, inflexible personality patterns, the key to dealing with People Pleasers is patience – and lots of it! Slowly allow the People Pleasers in your life the space to assert themselves, express their own thoughts and feelings, and make autonomous decisions. You feel uneasy when you have to make decisions on your own and are quick to seek assistance. I don’t know many people pleasers Nicola, though my Mum tries too hard to please everyone, then ends up tired. I used to try too hard to please everyone, I don’t any more. Susan, I think it is something we ‘grow’ out of as we learn that we cannot please everyone . . . and also that we shouldn’t please everyone if it is at the expense of our own health and well-being. I think this used to be me, but as I’ve got older I’ve realised that I don’t need other people to validate my worth, and also that being a doormat doesn’t get other people to like or respect me more (probably the opposite). Having children was probably the biggest influence in moving me away from that. Vanessa, the same comment that I just posted to Susan applies here – I think we do ‘grow’ out of it and learn that we can’t help others if we aren’t taking care of ourselves. It is so hard to be a people pleaser without turning into a doormat! Sad but true, I think I found the label for my personality, most of my working life has filtered my behavior, not allowing it to be destructive because there were many incentives for applying a submissive behavior, however, when I finally retired after 40 years, I feel lost and inadequate, It destroyed my self worth, now what, Is there anything left to repair to regain my identity? Tom, the way you feel at the moment is very common in people who retired; you are not alone. Have you found something else to fill the void of work? These behaviors have me taking an extra week in intensive out-patient therapy, because my people-pleasing (a.k.a…. in my case,codependency) is so hard to let go of!!! Have you found any useful techniques, Barbie? Thanks for the wonderful post. 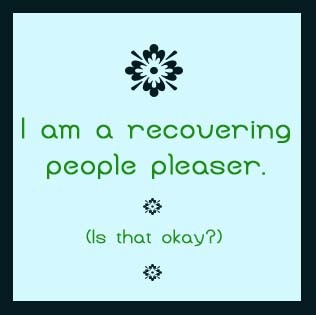 I am definitely a people pleaser. ignore my true feelings, dare not speak the truth, with the fear of hurting other people’s feelings. I need a balance between being nice to others and respect myself. Can you please kindly share tips how not to be a people pleaser? Jackie, I am going to develop a post specifically on this for you. Watch this space…. This is all very interesting….how can I learn more about it? I am definitely a people pleaser!! I stumbled onto this post. I was coming home from a difficult day of work and the thought crossed by mind that I am a “doormat”. As a lark, I googled and to my surprise I found that this kind of personality really exists and I am perhaps the poster child, albeit age 61 now. I spent a period of 23 years of my life living and working in West Africa, helping others and giving, which I now think really fit my personality. But now I’m back in the US, not really fitting in, self esteem lacking, and perhaps “walked on” sometimes. I enjoy pleasing people but I’m mentally tired. Physically I have the speed and stamina of a super hero, without the physique. Is it possible that people/employers, say in the workplace, can “smell” a people pleaser and use that to their advantage? I have tremendous experience in work and life, excellent heath and energy, college graduate with a BA in business, but am actually pushing carts to clear the parking lot. I told myself it’s because I’m 61 and descriminated against but perhaps it is because I don’t have the self esteem to pursue a better job. I started seeing a therapist and she said I focus too much on negative people because I try to please the abuser to feel accepted. I find this true and I’m trying to learn strategies to not be afraid of bossy people. This is me all the way. Actually started from my early years in elementary school when people used to pick on me a lot for various reasons. Today I always make it a habit to take care of everyone no matter how hard it gets and it is exhausting. Sometimes it goes as far as being emotionally exhausting. It’s something I’d like to get out of but the mere thought of it makes me believe I’ll be alone and everyone will stop caring about me. It’s a struggle. My mother is a people pleaser. Real doormat, however this has made her offsprings, really hard,and take no crap. We are all aggressive and confrontational. The worst is probably me, who has to I’ve with my mum, as she is now elderly and cannot do things. My sisters are far worse as being from an Asian family they feel they always wanted a male child. SO they have resented me the last child who is male. I struggle with people pleasing and get so fustrated that i couldnt say ‘no’ or ‘i dont agree with that’. I feel it is ruining my every day life. Are there any sure ways to stop being a people pleaser?